It's the key to keeping your shiny ornaments safe this year. 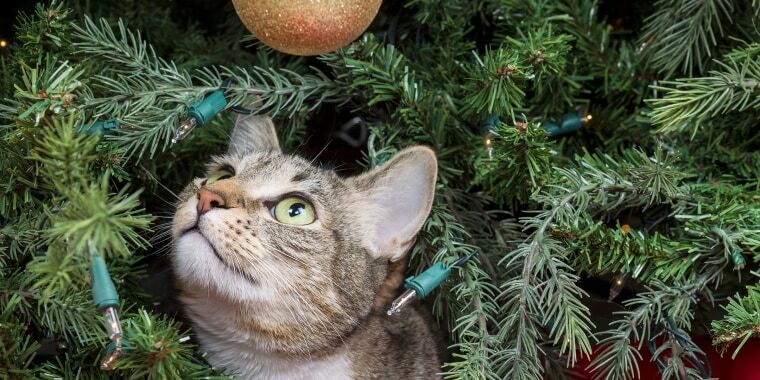 We all appreciate a little holiday sparkle, but those twinkling lights and shimmery ornaments can be major catnip for your feisty feline friends. Most cat owners know the struggle of keeping curious cats away from the Christmas tree and have their fair share of shattered ornaments to prove it. Luckily, the British company Argos created the perfect solution: a 6-foot-tall Half Parasol Christmas Tree. The artificial tree's branches form about halfway up the trunk, keeping your cat from wreaking havoc on your decorated masterpiece (unless your cat's a major jumper, of course). Argos made the unique tree for this very purpose, according to the product description, which reads: "Keep your perfectly placed baubles, bows and bells out of reach of curious, crawling kids or your cats' playful paws with this 6ft parasol tree." An added bonus? The tree's higher branches also mean you'll have lots more room for storing presents underneath! Made from polyvinyl chloride (or PVC), the fire retardant tree comes in a traditional evergreen version (73 inches in diameter) or a festive snow-covered style (44 inches in diameter). Intrigued? Those based in the United Kingdom and Northern Ireland can snag the half Christmas tree for £33 or the snowy version for £38 (both on sale now). Argos doesn't currently ship overseas — though, as its website says, you never know what might happen in the future.